Dec. 7, 2012 - PRLog -- Washington, DC – Fresh, well-tailored men’s fashions are coming to Cady’s Alley. EastBanc, Inc. and Jamestown announced today that popular online men’s clothier Bonobos has signed a long-term lease to occupy the south end 3320 Cady’s Alley retail space in its Georgetown Renaissance portfolio. The 1,000-square-foot space will serve as a Bonobos Guideshop location, offering customers an opportunity to be fitted and try on merchandise (by appointment) prior to making online purchases. Bonobos will replace the current occupant at 3320 Cady’s Alley, Yves Delorme, which is consolidating with its McLean and Bethesda locations. The Bonobos Guideshop grand opening is slated for late January 2013. Bonobos is the largest apparel brand in the U.S. that sells its product exclusively over the Internet, and the company prides itself on offering exceptionally tailored apparel to fit men and their lifestyles. Bonobos’ brick and mortar Guideshop sites were conceptualized to transform the customer shopping experience with personalized, realistic impressions of online inventory and to register clothing measurements for future Internet purchases. Currently there are six Guideshop locations in the U.S., including a holiday pop-up in Bethesda. The Bonobos space is prime commercial streetscape property in Georgetown and the gateway into Cady’s Alley. Augmenting the collection of distinguished designer brands currently located in the Georgetown Design District, Bonobos will round out the retail quarter as DC’s epicenter of modern fashion, furniture and lifestyle goods. The Bonobos deal is part of a recent surge of leasing activity in the Georgetown Renaissance portfolio, including deals with sophisticated retailers Intermix, CB2, Babette, The North Face, City Sports and West Elm. The Bonobos lease agreement validates the westward movement in Georgetown toward deluxe lifestyle offerings and will balance the current luxury fashion tenants – Intermix, Babette and Relish – with men’s trend-setting apparel. EastBanc and Jamestown’s Georgetown Renaissance portfolio, which includes Cady’s Alley, is a unique collection of high-end retail properties in one of Washington, DC’s premier retail locations. The portfolio also includes boutique office space and 16 luxury rental apartments. Georgetown Renaissance consists of more than 300,000 square feet across 17 properties in Georgetown and one property in Alexandria, Virginia. The two companies are working on an additional 30,000 square feet of new leases in Cady’s Alley. 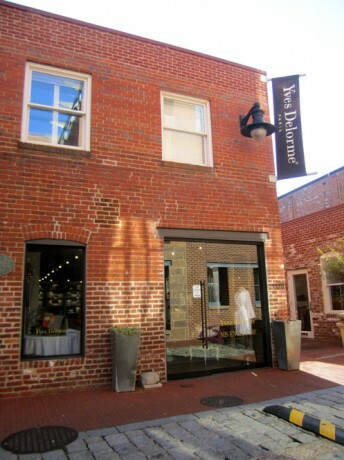 Cady's Alley, frequently referred to as Georgetown’s Design District, features international and local home furnishing retailers as well as trendy boutiques, along with the popular Kafe Leopold restaurant nestled in the Cady’s Alley central courtyard with indoor and outdoor seating. Cady’s Alley is a truly unique design-focused shopping destination within an entire city block of Washington’s historic Georgetown neighborhood. Retail showrooms feature lofted ceilings, glass and steel walls and stairs, exposed brick, and dramatic skylights. The retail corridor also includes the chic L2 Lounge, a prominent evening establishment, and a quaint pedestrian-friendly alleyway, accessible from 33rd, 34th and M Streets, NW. Founded in 1983 with headquarters in Atlanta, Ga. and Cologne, Germany and offices in New York City, San Francisco,, Washington, D.C. and Boston, Jamestown is a leader in acquisitions and value added management. Over 29 years, Jamestown has generated approximately $8 billion in strategic investments. The company is focused across the risk spectrum with core, core-plus and opportunistic funds in two primary markets: 24-hour cities and Sunbelt regions with strong demographic growth. For more information, visit www.jamestownproperties.com. Bonobos is based in NYC’s Flatiron district and was named “One of America’s Hottest Brands” by Advertising Age. The company is venture-backed by Accel Partners and Lightspeed Venture Partners in addition to other supporters. Launched in 2007 with better-fitting men’s pants, today Bonobos is the largest apparel brand in the U.S. launched solely over the Internet at www.bonobos.com. Bonobos has since expanded their clothing brand to include shirts, suits and other men’s apparel and now also offer a carefully selected number of curated brands. By combining great products, a hassle-free shopping experience and the famous Ninja customer service, the men’s clothier is on their way to becoming the best online apparel stores in the world.